Chelsea Clock is pleased to announce that it has reclaimed over 80 marine mechanical clocks installed on Victory Ships built by the U.S. Maritime Commission during World War II. These authentic military timepieces, produced for the U.S. Government in the 1940s, are being returned to optimum working condition by Chelsea’s certified Repair & Restoration technicians. As each piece in the Vintage Victory Collection is restored, it will be made available for purchase on this site. All 80+ clocks are being disassembled and ultrasonically cleaned. Any worn and broken pieces will be repaired or replaced. And cases are being revived, while taking special care to preserve their vintage appearance. Each clock bears its original Chelsea Clock serial number, and includes information about the U.S. Victory Ship upon which it sailed. 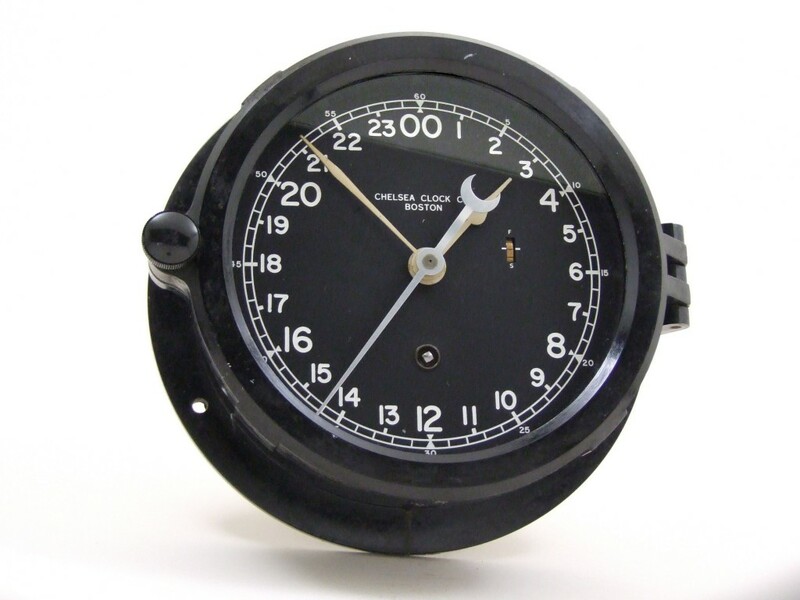 According to the serial number you have provided (serial number 298833), your 6″ marine mechanical clock was sold to the U.S. Maritime Commission on April 22, 1942. Just a word to say I’m very pleased with the time keeping of my Victory Ship mechanical clock, which is doing service once again as a radio room clock, but this time around in a shore Ham Station, where the old clock still gets to hear lots of Morse Code! I do suggest that on your website you could indicate that you cannot unfortunately identify the actual service history of all Maritime Commission Victory Ship clocks. For instance, the service history of my clock (ser. 447546, shipped June 21 1944), was not known. If by any chance you do now have this history, I’d certainly appreciate it. As indicated earlier, I’m a great admirer of the Victories, having seen them at sea and in port during my (peace-time) sea-going career. At sea on the Australian coast we often watched them pop up over the horizon and go past us! The sight of the cargo derricks luffed up to the mast cross trees ready for use in the next port, was a preliminary indicator that we were looking at a Victory. Those ships had good strong stable signals on-air, as well. Thank you for your note. We are very pleased to hear that your Victory Ship clock is keeping accurate time! Unfortunately, we do not always know the name of the ship from which our vintage Victory Ship clocks come, as we acquire them from a variety of different sources. You may wish to contact the U.S. Maritime Commission to request this background and provide them with the Chelsea Clock serial number. I would like to buy a vintage Victory/Liberty ship or any other vintage clock. How do I find the inventory and pricing. The best way to keep up with the latest vintage clock offerings is to sign up for our newsletter. Here is the link. Just choose “Vintage” as your area of interest. Here is what our records indicate for serial number 236270: This 8 1/2″ Ship’s Bell Clock was sold to Federal Shipbuilding & Dry Dock Company on September 29, 1939. Unfortunately, we do not have details about the ship on which this timepiece was installed. You may wish to contact the U.S. Maritime Commission for further information. Thank you for your interest. Esto es lo que nuestros registros indican por el número de serie 236270:. Campana reloj Este 8 1/2 “de la nave fue vendida a la construcción naval Federal & Dry Dock Company en 29 de septiembre 1939 Por desgracia, no disponemos de información sobre el barco en el que este reloj fue instalada. Puede ponerse en contacto con la Comisión Marítima de los EE.UU. para obtener más información. Gracias por su interés. Hello I have a 24 hour Us Navy Chelsea Vintage clock it measures 6 and a half inches across the face the serial number is 6169E. Would like to know the year of manufacture and possibly what ship she was commissioned to. Any Information would be greatly appreciated. Thank You. Thank you for your note. Serial number 661011 was sold to the United States Army on February 18, 1963, and it was listed as a 6″ marine mechanical clock. This is all that we show in our manufacturing log book. I hope it is helpful. Thank you for contacting Chelsea Clock! I have a clock from the Liberty that was sinking on its way back to port. The sailors were taking items off the ship before it was to be scrap metal. The # on the back is 300477. Face is 8″ and 10″ over all. It’s all brass with a white face. Can this clock be restored and how much to restore? Both the clock and barometer are working and appear to be in superb physical condition inside and out. They are obviously fairly old, and exceptionally well made instruments. I would be curious to know if there is an indication of where the factory originally sent this clock. Hi Bill, Thanks for your inquiry. If you wouldn’t mind, please email me this request at lindsayt@chelseaclock.com and I will pass it along to our resident historian. Thank you! HI, I WUOLD LIKE TO NOW ABOUT THIS SERIAL NUMBER 632 700, ON FRONT READS THIS GEO. E. BUTLER CO SAN FRNACISCO. ALL INFO. IT WILL BE SO HELPFULL. THANKS. Can you please send this request, along with the photo, to me directly at lindsayt@chelseaclock.com? Once I get the email request I can easily check with our records department for you. Thank you! HI, AGAIN IF NEED A PHOTO JUST LET ME NOW. Hey folks, I just stumbled across Chelsea Clock Serial Number 431. It is a black phenolic case and a polished metal face. It is a 12 hour dial and reads “U.S. Maritime Commission” just below center. Could you provide any information on this? Hello, I recently acquired one of these clocks with the face stating “Ser No. 1942”. This is a brass faced dial. I’m wondering if this was refinished at some point; or possibly made that way? Also, there is a problem in the mechanism. I can turn the winder, but it won’t catch; and it unwinds. Is this a “sprung” spring, or gear problem you think? I’m wondering if a repair part is available? Thank you. I have a white faced U.S. Government clock with a key. My dad acquired it roughly 20 yrs ago. It has 1-12 hrs for the large #’s and 00-23 inside those #’s. It doesn’t have a serial # on the face and I’m afraid of taking in apart for the serial # on the inside. Looking at the back of it there is a number scratched into it that I’m hoping could be the serial #. It is 658061. Maybe there is some info available from that #. My Father In Law passed away and we found this. “He was in the Navy”. Chelsea clock. US Navy, Serial #82703E. Any info on it? Can you tell me which Ship it was on? How much this is worth? Hello, I would love to find out which ship my Chelsea clock was from and what year it was made if possible. The number on the back says 308946. If you have any information I would greatly appreciate it! I have a Chelsea 24 hour US Navy clock that I got after my Grandfather passed away. I have no desire to sell it but would like to know where it came from. The only serial number visible is on the clock face and is 31635E on the face of the clock. Don’t want to take it apart to look inside for another and was just wondering about the history of the clock and approximate value for insurance reasons. Hello, I have a beautiful Chelsea US Navy clock, Serial number 118900, with a face serial N 2453. Would love to know the origin and if it ever sailed. Also, is it possible to have them serviced and have parts replaced as necessary? In advance, thank you. According to our manufacturing log, this clock is listed as a 6″ Marine Mechanical Clock, originally sold to the U.S. Naval Observatory on May 3, 1918. You are welcome to send this clock to Chelsea for evaluation and free estimate to repair and/or replace any parts. Simply visit our website at http://www.chelseaclock.com/p/repair-restoration/ for details. Thank you! Thank you for your inquiry. Unfortunately, there are too many numbers and none happen to match entries in our manufacturing log. We would need to see an image or the actual clock in order to locate the actual serial number and research its background. You may wish to visit our Repair & Restoration section for more information. Thank you! My 1st husband served in the Navy. He passed away in 1963. Chelsea clock he left me was # 643749. Any value and information on it? According to our manufacturing log, serial # 643749 is listed as a 3 3/4″ Ship’s Bell Clock, originally sold to J. B. Hudson Jewelers on December 5, 1960. Unfortunately, that is all the information that we have on this piece. Chelsea Clock does not provide appraisal services. However, you may wish to bring it to a local antique dealer for an appraisal and current market value. Thank you! Chelsea Navy clock #643749 0r 693749. I can’t tell for sure if there’s a 9 or a 4 in 2nd spot. Please give information on Chelsea clock #643749 or 693749. I can’t tell if the 2nd # is a 4 or a 9. I have a Chelsea Clock Company Boston. It has U.S. Navy Clock under Hands (3 hands). 00-23 for a 24 hour Clock. It also had the round sprocket with E on top and F at the Bottom. Any Idea what ship and and Value? Thank you for your inquiry. Unfortunately, Chelsea Clock does not have information on what ships our clocks have sailed; the U.S. Navy assigns those serial numbers and tracks that information. CAlso, Chelsea Clock does not provide appraisal services. You may wish to bring the timepiece to a local antique appraiser for information on current market values. Thank you. I requested information several months ago, and never received a reply. I have a Chelsea U.S. government Navy ships clock from the 1960’s. Serial number looks like 643749. All in tact and in very good shape. Chelsea wind key included, inscribed ” Chelsea”. Any value you can give me? Out apologies for the delay in responding! Thank you for your inquiry. According to our manufacturing log, serial #643799 is listed as a 3 3/4″ Ship’s Bell Clock and was originally sold to J. B. Hudson Co. on December 5, 1960. Unfortunately, that is all the information that we have on file. Chelsea Clock does not provide appraisal services. You may wish to bring it to a local antique dealer to inquire about its current market value. Thank you! I was wondering if you can tell me a little about my Chelsea 24 hr U.S. Navy clock. It has a serial number 84899E on it. Thank you for your inquiry. Unfortunately, the serial number you have provided does not match an entry in our manufacturing log. If you could provide the serial number stamped onto the movement, it may prove more helpful. Thank you! Thanks for the information, I opened my Chelsea clock and found the correct serial number on the internal workings, amazing workmanship, spent a solid 45 minutes totally absorbed with all the moving parts. The serial number is 489492. I real hope you can find some info on this beautiful clock. According to our manufacturing log, serial number 489492 was originally sold to the U.S. Navy on May 30, 1945, and is listed as an 8.5″ Marine Mechanical Clock. Hope this is helpful! Would 658061 possibly be a serial #? I have a white faced U.S. Government clock with a key. My dad acquired it roughly 20 yrs ago. Would 658061 possibly be a serial #? I posted a year ago and didn’t get a reply so I figured I’d try again. Our apologies for not responding on your earlier inquiry. According to our manufacturing log, serial number 658061 was originally sold to the U.S. Navy on October 11, 1962, and is listed as an 8.5″ Marine Mechanical Clock. Unfortunately, that is all the information that we have on file. Many thanks! I have a 24 hour Navy clock and it says serial number on the face, but there is no number. Anybody know why or have details? Assume it may be on the inside. The clock works really well and I’m not sure I want to risk taking it apart to find out. I have several Chelsea maritime wall clocks, some with a number on the face and some blank. The oldest has a hand scratched N superimposed on an O and a four digit number. I believe the number on the face indicates a particular clock had been certified by the US Naval Observatory laboratory. The clocks I have with the space on the face left blank were World War II era. I presume there simply was not enough time for the huge number of clocks that were put into service for the war effort to be individually tested by the USNO. The Chelsea serial number is stamped on the movement and also usually appears on the back of the case. The number on the case is sometimes not the same as the movement because government service depots sometimes swapped movements in order to get clocks back into service faster. The government was not as especially interested in maintaining the historical nature of its clocks. Hello Mike, The serial number on the dial was assigned by the U.S. Navy. Unfortunately, we would need the serial number that is etched either on the back of the clock case or on the mechanism inside the clock. If you can provide that to us, we may be able to find some information in our manufacturing log book. Thanks! I have a Chelsea 6in 24hr clock, which is still keeping “perfect” time (+/- 10sec per week). The dial has s/n 18031E stamped below U.S. NAVY. Would you have any information of its antecedents? Thank you for your note. Unfortunately, we would need to know the serial number located on the mechanism in order to provide any available information from our manufacturing log (the serial number on the dial was assigned by the U.S. Navy). Thanks! Our condolences on your father’s passing. According to our manufacturing log book, serial number 675228 was originally sold to the U.S. Navy Department on May 29, 1964, and is listed as a 6″ Marine Mechanical Clock. Unfortunately, that is all the information that we have. We hope this is helpful. Hello I have a 24 hour Us Navy Chelsea clock it measures 6 and a half inches across the face ,and is marked U.S. Navy SER. No. 34909E .The clock case appear to be Bakelite. I would like to know the year of manufacture and possibly what ship she was commissioned to. Any Information would be greatly appreciated. Thank You. Thank you for your note. Unfortunately, the serial number appearing on the clock dial was assigned by the U.S. Navy and we do not have access to that information. However, if you can provide the serial number that appears on the mechanism, we may have information about the year of manufacture and to whom it was originally sold. Thanks! I have a 8 1/2 ” 24 hour bakelite US Navy clock serial on face is 364E, on back are 2 numbers first is DT-0407-1092e4, then there is 220260. both of these are scratched into case. Any info would be wonderful. I have a clock with US Navy ser no. 71114E. Wondering when and where was this clock used. Hi! I have an awesome Chelsea US Maritime Commission clock with serial number 389913. It also has an access aperture about 1.5” on the back covered with a brass plate that says John Tod. Any information you can give me on the history of it? You guys make outstanding clocks by the way! Thank you in advance.